The factory Brembo brakes on the R35 Nissan GT-R are just that - factory brakes. They are huge, well built factory brakes. Adequate for most people under most circumstances. 6 piston front , 4 piston rear. 380 mm rotors front(34mm thick) and rear(30mm thick). On a street car, you want a braking system, that is there when you need to do a panic stop on the 405 freeway. The traffic that was just going 70, is now going 0, and like a huge accordion , your stopping distance gets shortened by every car in front of you. 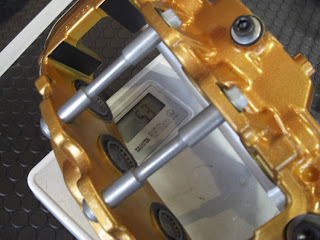 The factory Brembo 6 pot caliper above looks like it weighs 5.3 kg ~11.6 lbs. Something else more interesting to me is the cooling holes drilled in the pistons. I don't know if any other factory cars have cooling holes in the pistons. The Brembo monoblocks we had on the World Challenge car had pistons like this. They supposedly help with cooling, and I am not going to argue with Brembo. The R35 GT-R factory calipers have a removable bridge that looks like it makes servicing easier. Probably not as stiff as some of the other 6 piston monoblocks they make. The GT-R is a street car after all. Here's my take on brakes. We went to the PRI show a few years ago,and talked to a lot of companies about brakes. We were thinking of changing the Brembo 4 pot monoblock on the racecar to something else. We didn't have brake issues, but were just exploring our options. Every company we went to sit down and talk to, started their sales pitch with "We are better than Brembo, because...."
Well I wrote more on this post, then accidentally published over it. Opps. Back to the World Challenge car,it made a lot more sense to stay with what we had, change pads, and rotors, and see how it went. After all, everyone else was comparing themselves to Brembo. So now instead of what I wrote , I will put something else I wrote up a while ago. Many people upgrade brakes to huge rotors and calipers with never a need to use them. Most of the time, a larger brake rotor and caliper will not actually stop better than a stock rotor and caliper. Stock pads are setup for long life, and good cold stopping power. If you are going to the track, or enjoy some spirited driving, here are some things to try first. 1. Change the fluid. AP Racing AP600 or Motul 600 is a good fluid for a street car. A GT-R is heavy, so you always need to take this into account. DOT 3 and DOT 4 Brake fluids attract water and should be changed bled every year or so in a serious street car. More often if you are into that kind of stuff. Castrol SRF is the top of the top. Expensive, but well worth it in my opinion. 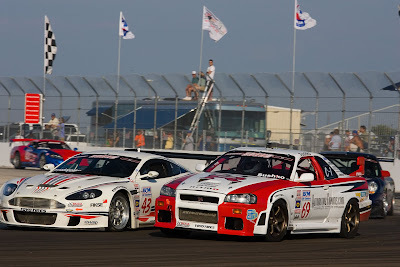 On the World Challenge R34, we saw a dramatic difference in bubbles and fluid color going from Motul 600 to Castrol SRF. Some guys running Motul 600 are boiling the fluid during track days. Another option besides the SRF is AP Racing PRF. Developed initially for the brutal environment created by carbon-carbon racing brake systems, PRF 608 sees use in Formula 1, NASCAR, LeMans prototypes and other extreme high temperature racing applications. 2. Bleed the brakes well. A good bleed with give you a good firm brake pedal. The mushy wet duck feeling while standing on the brake pedal does not inspire much confidence. Nissan recommends bleeding the GT-R brakes cold, and warm. Getting the brakes warm, can free trapped air pockets. Another way to free trapped air pockets is to tap the calipers with a rubber mallet. 3. Good pads. The definition of good would vary from person to person depending on application. For a street car, something with a good cold bite. Something that doesn't chew up calipers would probably be what you want. Ferodo DS2500 are good for street and light track use. 4. Brake ducts. Funneling air to the center of the brake rotor helps out a lot with brake issues. The cooler you keep the brake rotor, the less heat it transfers to the caliper. The less heat you transfer to the caliper. The less likely to boil the brake fluid. At least thats what I think happens. STILLEN has a brake cooling kit, now available for the front and rear of the Nissan GT-R.
5. Stainless Steel Brake Lines . Stainless steel braided lines are stiffer than the factory rubber brake lines and help with pedal feel. Even Nissan changed the firmness of the Nissan GT-R brake lines from 2009 to 2010. 6. Brake Rotor Upgrades. The OE brake rotors crack due to the cross drilling, when run hard on the track. AP Racing has a curved vane brake upgrade in slotted and J-hook configuration that last longer, and are less expensive than the factory rotors. Did you know that 300 Below, Inc. is cryo treating brake rotors for the GT-R? Take a look at their photos at http://www.300below.com/cryo-processing/cryo-rotor-brake-rotors.html which I think it pretty cool. With rotors this expensive, I think it's worth it to increase the life by 300%! Many people have even tried it on brake calipers to prolong any corrosion issues.